Graphics courtesy of Brendan Lordan. Nineteen dollars and four cents. That is, at the very minimum, how much money you are paying for a cheeseburger and a fountain drink at the diner when you pay with meals on a seven per week meal plan. Do you know how much your food costs? Not the price on the menu at the Diner, or the label underneath the bag of chips at Larry’s Market, but how much money is being transferred from your possession to the vendor’s. The answer is not as simple as the listed price or a couple of “meal swipes.” Aramark’s meal plan system can be a handy, standardized way to pay for food on campus, but it can also lead students to unknowingly spend large amounts of money on food. Similar to the psychology of poker chips that casinos use to coerce gamblers into spending more than they have, by convincing you you’re only paying with meals instead of the equivalent cost in cash, these services make the food seem cheaper than it actually is. You feel like you’re only paying one or two meal swipes — an arbitrary credit system — when you’re actually forking over $10 or $20 for a snack. 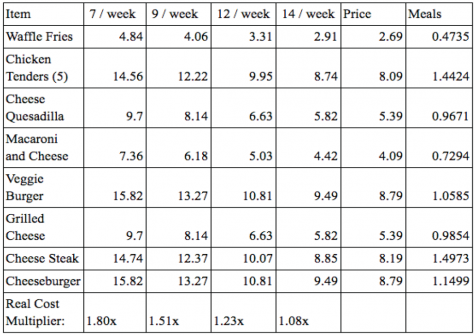 When you bought your meal plan, did you sit down and calculate how much each “meal” cost you? Consider that meals have a value of $5.47, less than what you’re paying for each meal with any plan, excluding the unlimited plan. For now, let’s put aside the fact that when purchasing something from the Diner, you always have a little money left unused so you can fit the cost of your food within the $5.47 meal value. 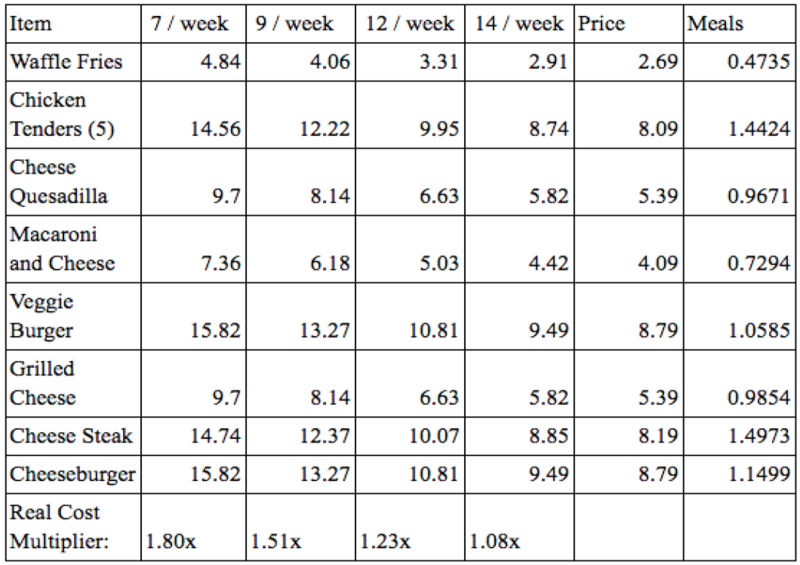 We can find the number of meals each food item costs by dividing the price of the item by the $5.47 meal value (e.g. the list price for five chicken tenders is $7.89, or 1.44 meals). Multiplying this cost in meals by the price per meal for each plan gives us the real cost we pay for each item. The menu breakdown covers the costs for each plan. For $15.82, one can buy 15 cheeseburgers or nine double cheeseburgers from the Burger King on High Street. For the same price students with a seven-per-week meal plan pay for a cheeseburger and a drink using meals ($19.04), they can buy, at the typical store price, a pound of ground beef, eight hamburger buns, a tomato, a head of lettuce, 16 slices of American cheese and a 12 pack of soda, and still have a few dollars left over. Not to indicate that fast food is a sustainable, healthy way for a college student to live, but for $15.82, one can buy 15 cheeseburgers or nine double cheeseburgers from the Burger King on High Street. This comparison does not factor in the bulk prices that food companies pay for the individual ingredients. Continuing with the hamburger example, wholesale 2 oz. beef burgers sell for around $40.00 for a package of 80. This means that companies like Aramark pay less than $0.50 for a patty that they then sell to students for several times the price they paid. There are other aspects of the Aramark system that leave students with more meals than they can use, therefore driving up the price per used meal that the student is paying. Most notably, the hours that the most popular and economical dining spot, Lawrence Dining Hall, prevent students with evening classes and obligations from using their meal swipes there. The dining hall closes at 8:00 P.M. on weekdays and 7:00 P.M. on weekends, too early for many students to attend. Even when the dining hall is technically open, the time between the lunch and dinner rush is barren, with limited access to the kind of food that the dining hall advertises. Students can end up with dozens of extra meal swipes because their schedule prevents them from fitting in the strict hours of the dining hall. 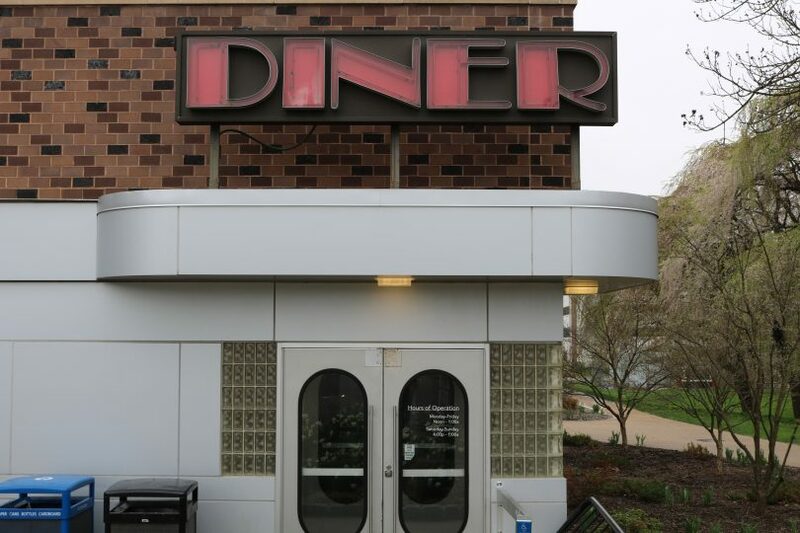 Even the late night options at Sykes close around 10 P.M., leaving the diner as the only place to spend meals. While the food at West Chester may be marketed as a system adaptable to the needs of its students, what is the real cost when the cheapest meal plan may cost the purchaser almost $20 for a late night snack? Bravo, Brendan. This is something that has been hidden in plain sight all along, but I am glad you have taken the initiative to expose this type of robbery. As a former student of West Chester and several other universities, I think WCU does a pretty good job of remaining affordable in comparison to many other colleges; however, it is this type of nickel and diming that has either left so many students in debt or unable to afford to go to college in the first place, especially when a meal plan is mandatory while living on campus as a freshman (or at least it was, it has been a few years). Although I only graduated a few years ago, I come from the tail end of the generation who were told to go to college at any cost. Now, many of us are realizing that those costs weren’t worth it as we are crippled with student debt and are putting off taking career risks, buying homes, starting families, etc. as a result. I am glad that many college students today seemed to have learned from our mistakes and are starting to question the status quo, You see it happening as some expensive private universities with low ROI begin to close while others lower tuition and many people are choosing to begin their higher education at community colleges or forego it altogether by choosing careers that allow you to learn on the job. Let’s be honest, nearly every job requires you to learn on the job anyway regardless of your education level. With all this said, I still strongly believe that WCU provides you with the most bang for your buck as long as you choose the right major. Hell, it was a lot of fun too. This is nothing compared to what is taking place within the bursars office. Link attached if you want to read a real story taking place behind the scenes students and families don’t know about. How about you start asking the president some questions about this story he will definitely decline you.